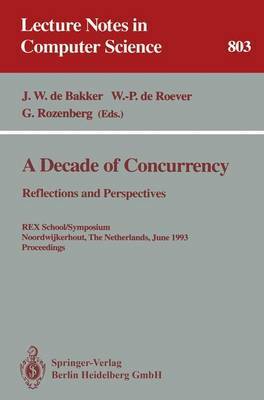 The REX School/Symposium "A Decade of Concurrency - Reflections and Perspectives" was the final event of a ten-year period of cooperation between three Dutch research groups working on the foundations of concurrency. Ever since its inception in 1983, the goal of the project has been to contribute to the cross-fertilization between formal methods from the fields of syntax, semantics, and proof theory, aimed at an improved understanding of the nature of parallel computing. The material presented in this volume was prepared by the lecturers (and their coauthors) after the meeting took place. In total, the volume constitutes a thorough state-of-the-art report of the research activities in concurrency.